Our team has made some minor changes to Goalbook Pathways that we are really excited about. The changes we’ve made are a small step in a direction that we hope will have a big impact on the way that teachers who use it will think about intentional instructional design. Our team has done the work of deconstructing some existing standards pages in Goalbook Pathways and reorganizing them into skills and concepts. Each of the identified skills has assessment item progressions and quick assessments connected to them. Our hope is that teachers can engage students in higher order thinking skills at a substandard level so when they are met with the task of mastering the overarching standard, they’ve already mastered the small skills they need to do so. 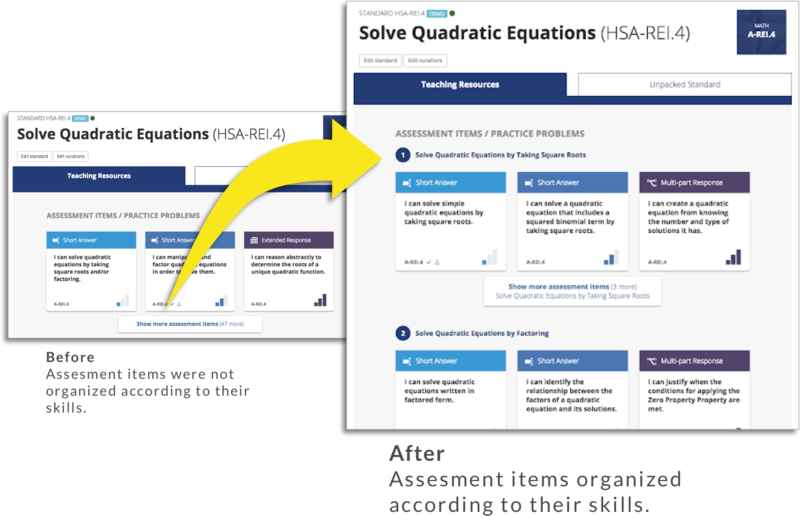 These enhancements really put learning at the center of instructional design. We believe that if teachers are intimately familiar with what mastery looks like at every dimension of a standard then they can prepare students in a strategic manner. By reorganizing the content of Pathways’ Standard Pages teachers have the ability to sequence their instruction logically and dive deep with focused instructional objectives. The reason we are starting at such a small scale is that we are largely concerned with learning about what is best for teachers. We want to learn whether or not the enhancements we’ve made change the user experience and positively impact teachers’ instructional design process. We want to learn if this design shift makes it easier for Teachers to identify relevant assessment items from an ever-growing list. We also want to learn whether or not this design shift supports Teachers with designing multiple days of instruction around a single standard. We will continue to publish updates on the progress of this project as we learn more about the impact of these changes.